Researchers from MIT and other institutions have discovered a new phenomenon of the behavior of plasmons (a kind of quasiparticle) as they move accross tiny ribbons of two-dimensional materials, such as graphene and transition metal dichalcogenides (TMD). These materials possess a hexagonal structure similar to chicken wire. Researchers used the spin of light to guide the flow of optical information. Shining right-circularly polarized light on nanoribbons made of special 2-D materials enables light to flow forward on one edge and backward on the other edge. Changing the polarization of the light causes the guided modes to reverse directions (Image: Anshuman Kumar Srivastava). The team identified that it is possible to separate the plasmons into two different streams, traveling in opposite directions at the ribbon edges, similar to the traffic on a double-lane highway. This separation is possible without any strong magnetic fields or any unusual conditions. Nicholas X. Fang, associate professor of mechanical engineering at MIT, and Anshuman Kumar, who is a recent PhD graduate from the same department, carried out the research work with four other researchers from the University of Wisconsin at Milwaukee, Minnesota University, and the Hong Kong Polytechnic University. The study result have been published in the Physical Review B journal. Similar separated flows have been observed by other teams before, informed Fang. However those teams used strong magnetic fields for separation, and the newly developed process relies on the optical effects from beams of circular polarized light. The results are based on exotic states of matter, which can be observed in 2D materials that possess a bandgap. This property is essential for devices such as solar cells or transistors. Graphene can also be modified to have a bandgap. One phenomenon of quantum physics, called Berry curvature that can be observed in configurations called massive Dirac systems, is the basis for these states of matter. 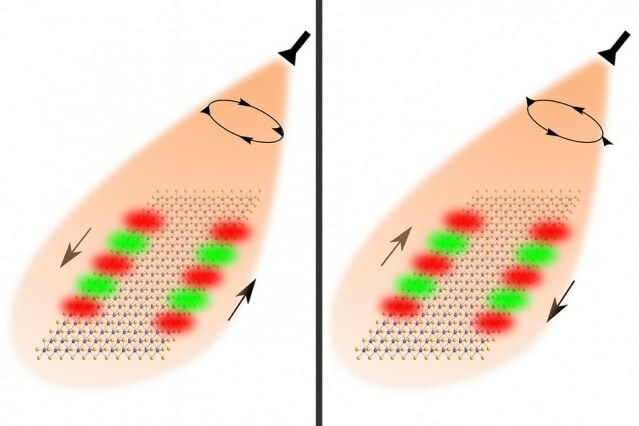 The phenomenon involves surface electromagnetic properties called surface plasmons, and the researchers say that it hasn't been fully explored so far, despite it being the subject of intense research. The team revealed that the shining circularly polarized light beams onto the graphene ribbons causes the electrons to cluster in the material into two different “valleys” in the band structure. The unusual symmetry properties of this system cause Berry curvature, which can be considered an artificial magnetic field. Under these conditions the valleys are in correspondence with the motions of the plasmons, which can be viewed as a type of oscillation of electron density in the material that move in opposite directions on the two sides of the material. The width of the graphene ribbons is 50 nm. It is possible to measure this effective magnetic field by passing a second polarized beam. By measuring the transmission of this beam, the effects occurring in the surface plasmons can be directly measured from the polarization changes. “This is exciting,” Fang explains, due to the possibility of manipulation of the electromagnetic behavior of such systems and measurement of the results obtained from these manipulations, paving the way for new types of electro-optical devices, he said. For instance, some experimental photonic systems use devices known as optical isolators that do not allow the light beams in precision optical systems to reflect back to their source and produce interference. He also adds that these isolators are bulky in nature due to the need for powerful magnetic fields, with limited applications. With this concept it’s possible to replace these bulky optical isolators with one monolayer of two-dimensional material. With this kind of system, Kumar says, it must be possible “to do chip-scale optical isolation without the need for a magnetic field.” He also says that with a conventional system, to get a similar degree of optical isolation that can be obtained with this system, a powerful 7 tesla magnetic field is required. Theoretically this advancement could help to develop a new kind of memory devices that allow writing and reading of information using a polarized light beam, and are unaffected by electromagnetic or other forms of interference, according to the researchers. The concept presented in this paper is very interesting and exciting. In the long run, it may be possible to construct an electrically tunable on-chip isolator based on this concept, which can be a very critical component in integrated optics. Besides Kumar and Fang, George Hanson and Andrei Nemilentsau from the Wisconsin University at Madison, Tony Low from the Minnesota University, and Kin Hung Fung from Hong Kong Polytechnic University also contributed to the work. The research received support from the Air Force Office of Scientific Research and the National Science Foundation.